My family and I go to a great church (Freedom Church in Acworth, Georgia) and they have a really stellar kids ministry, so one of the things I fear the most has become a relevant issue in my life lately. My four year old son, Camden, has been asking a lot of questions. Questions about God, about Jesus, about the cross. And I’m so terrified. I’m not that good at being a good Christian dad. I pray infrequently, and I’m terrible at it when I do. I have a reminder set in my phone to do my Bible reading plan every day, and I’m currently an embarrassing number of days behind. Because of work, I haven’t made it to four of the last six sundays of church. How in the world am I supposed to help him see the way to get to Christ, to know Him, to love Him, to do mighty things for Him when I’m so broken and jacked up? And the fears don’t end there. What if he seems to come to faith and because of his age he doesn’t truly understand what’s happening and it prevents him from being converted for real one day? Or what if, because we go to such an awesome church where he’s learning so much he never considers that he needs the Lord to be in his life in the most significant way, what if he thinks hes already got something he never received? On some level I know these are the kind of fears all parents, particularly Christian parents, experience. It doesn’t assuage those fears one bit. I’ve tried to step outside myself and think of how I would counsel someone who expressed these fears to me. I’m not sure there is a sufficient answer. In fact, I’m pretty sure there isn’t one. There are theological answers, to be sure, but what I’m having and what you may be having also is an emotional problem. It’s the same as when someone asks, “If God is so good, why did he let my father die?” or any other variation on that question. Emotional questions don’t usually have logical answers. In the best of times our emotional response to any situation can only be modified by reason if it is applied in a disciplined way. When it comes to the fears I’ve described, I’m convinced intentionality, discipline, and prayer are the surest ways to address them and I’m equally sure that in the end the struggle is more of a tension to be managed than one to be resolved. If you’re feeling the way I do about any situation in your life, just imagine how meaningless and empty life would be if we didn’t have people in our lives for whom we cared so much that we would be paralyzed by the fear that their lives would not someday be transformed by Christ. Update: It’s a little early to be giving away behind the scenes info, but this post was written much earlier than it was posted (early November in the this case). On December 23rd Camden informed his mother and I that he had “asked God into his heart”. We are overjoyed to say the least. This doesn’t completely eliminate my fears, but after some serious questions we feel pretty confident that he not only knew what he was doing but that he also understood far more about what it meant than I would have expected. If you’re reading this and you have a child of any age who has not yet accepted Christ let me just say, take heart, it may sneak up on you when you least expect it. 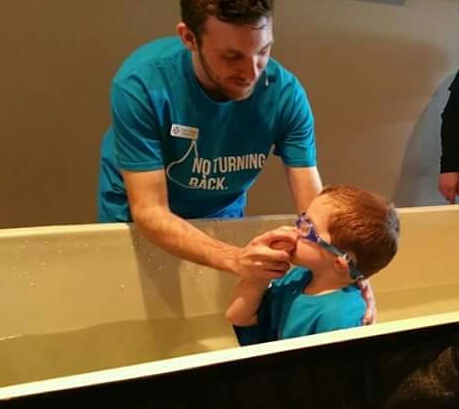 Update: This past Sunday, February 8, 2015, Camden was baptised. We are so grateful to everyone at Freedom Church Acworth Campus. But especially to two people. Pastor Caleb Johnson (pictured) not only performed the baptism but encouraged and taught Camden about what was going to happen in the days and weeks before, going as far as to send him a special video message. He’s one of so many special staff members to our family. The other is Heather Kenny. She was instrumental in encouraging us, and Camden and helping us lead him through the decision. We couldn’t be more proud. Feel free to let me know what your experiences are in the comments section. I look forward to praying for you and praising with you.